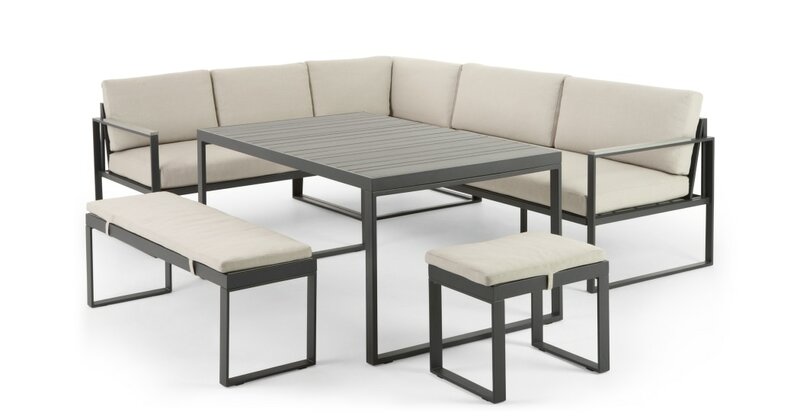 Whether you’re planning a family gathering or hosting a flurry of summer occasions, our outdoor corner dining set means you can extend your hosting space and showcase your beautiful garden. This set includes a roomy corner sofa and a large dining table so you can easily rearrange your set up. Designed with clean lines and a sophisticated colour palette, it’s a minimalist collection that will enhance the greenery and blooms you’ve got going. Catania comes with detachable, thickly padded cushions for extra comfiness. It's built to endure the weather which is handy - just remember to cover it or take it inside during heavy rain.